A recent lecture led by Patricia Garcia, MD, MPH, ’91 GME, associate dean for curriculum, (left) discussed how augmented, virtual and mixed reality might play a role in medical education. 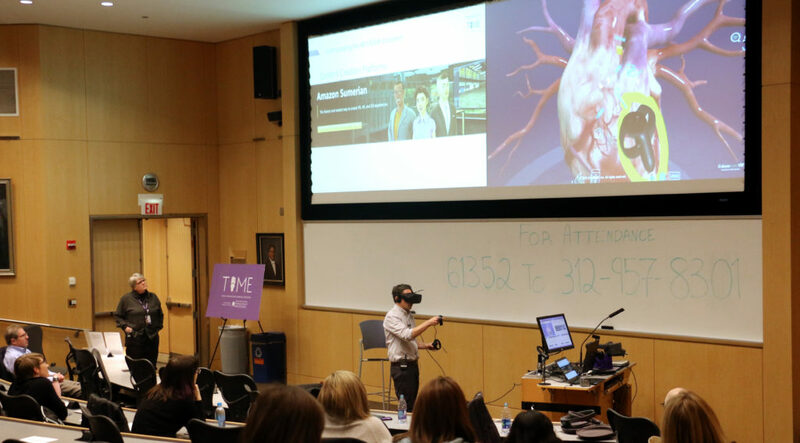 “Are we ready to learn in three dimensions?” posed Patricia Garcia, MD, MPH, ’91 GME, associate dean for curriculum, during a recent lecture that explored the budding use of augmented, virtual and mixed-reality media in medical education. The Today’s Innovations in Medical Education (TIME) lecture, held November 20, was attended by Feinberg faculty, students and staff. TIME, sponsored by the Feinberg Academy of Medical Educators (FAME), is a monthly lecture series dedicated to highlighting technological advances, new pedagogy and best practices in health professions education. 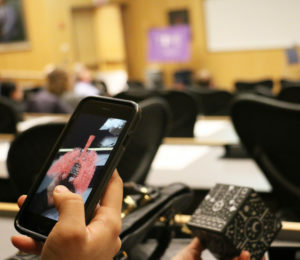 During her lecture, Garcia clarified the differences between augmented (AR), virtual (VR) and mixed (MR) realities, shared examples of current tools and their potential applications in medical education, and suggested the need for an ongoing discussion about the use of such technology at Feinberg. Audience members explored some of the mixed reality tools Garcia and Salisbury discussed, including MERGE Cube. Garcia was introduced by Walter Eppich, MD, MEd, director of FAME and associate professor of Pediatrics in the Division of Emergency Medicine and of Medical Education. Joining Garcia was Rick Salisbury, associate director of educational technologies at the Kellogg School of Management, who helped demonstrate a number of new tools for the audience. 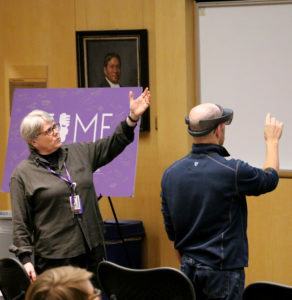 Using the Microsoft HoloLens — an augmented reality headset — and an app called “Insight Heart,” Salisbury conjured a beating heart into the lecture hall space. Garcia demonstrated the use of the inexpensive MERGE Cube, a holographic appliance that can work with anatomy apps on a smartphone to produce virtual images, such as a brain or the lymphatic system. Garcia also shared the first application of AR/VR technology at Feinberg: a neurosurgery virtual reality program created by Michael Walsh, MD, a health system clinician in Neurological Surgery. Inspired by his children’s love of VR games, Walsh created a “flythrough” of the base of the skull using CT scans. He now uses the program to help teach skull-based anatomy to residents and fellows. Garcia and audience member Russell Horowitz, MD, associate professor of Pediatrics in the Division of Emergency Medicine, during a demo of the Microsoft HoloLens. During the lecture, Garcia also provided preliminary data on learning outcomes from a few uses of VR in medical education at other institutions.